Either something very good happened at CW last night, or there were local preemptions that will lead to adjustments on Monday. ABC: ONCE UPON A TIME gained 0.1 to 0.5, AGENTS OF SHIELD held at 0.5, and 20/20 lost 0.1 to 0.4. CBS: The line-up returned from its NCAA Tournament break, with MACGYVER down 0.1 to 0.8, HAWAII 5-0 up 0.1 to 1.0, and BLUE BLOODS up 0.1 to 0.9. NBC: BLINDSPOT slipped 0.1 to 0.5, TAKEN fell 0.1 to an ugly 0.3, and DATELINE held at 0.6. FOX: MASTERCHEF JR remained at 0.8, followed by a 9-1-1 rerun at 0.5. 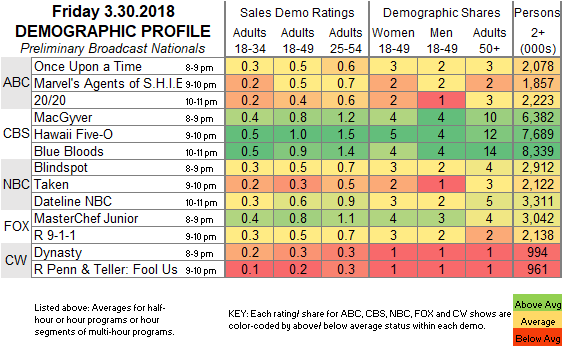 CW: Currently, DYNASTY is up a big 0.2 to 0.3, with a PENN & TELLER: FOOL US rerun at 0.2. Tonight, TBS, TNT and Tru share the Final Four NCAA TOURNAMENT games. On Sunday, the Easter event is NBC’s live JESUS CHRIST SUPERSTAR, and on cable, Starz airs the season finale of COUNTERPART.